Do you have two kids with small age difference or maybe the baby no. 2 is on the way? You don’t have to buy expensive and bulky double stroller. Recently a new expandable stroller has appeared on the market: Evenflo Pivot Xpand Modular Travel System. It grows with the family, it’s good-quality and inexpensive. What more could you ask for? Expandable strollers are so popular right now. We have amazing UPPAbaby VISTA, Baby Jogger City Select and City Select LUX, Nuna Demi Grow, Thule Sleek (coming soon)… But all these strollers have one drawback: they are so expensive. Purchasing the stroller frame plus two infant car seats plus two toddler seats it’s often a cost of $1000 or even more! 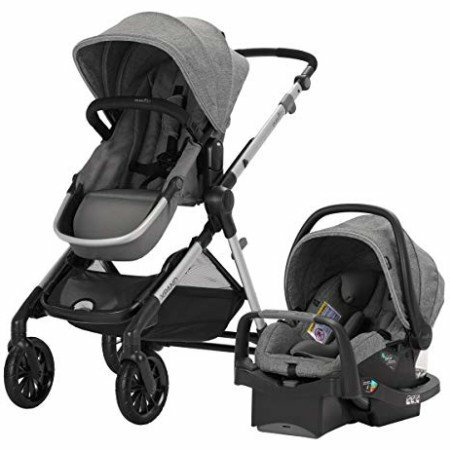 Expenses with two children are really big so it’s not a surprise that not all parents can afford these luxury, high-end strollers. If you’re here you’re probably on a tight budget. Don’t worry! I’ve got for you a great new pocket-friendly alternative for these pricey strollers. And you’re going to love it! 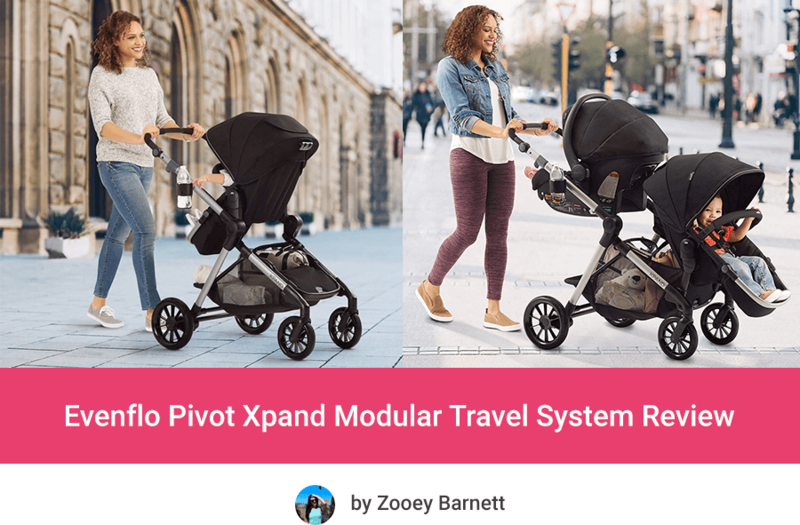 Let me introduce you brand new Evenflo Pivot Xpand Modular Travel System – stroller that expands from a single to a double mode and costs like two times less than VISTA or Demi Grow. Okay, but price is not everything, right? What about its features, pros and cons? Of course I’ve checked that for you too and I’m excited to tell you more about Evenflo Xpand stroller! Keep reading and you’ll find out everything you want to know about this new low-budget expandable stroller. As I’ve already told you this stroller grows with the family. It offers 22 seating options for one and two kids. The pocket-friendly price is the cherry on top. Evenflo Pivot Xpand Modular is ready to be used for one or two babies! As you can see with this equipment you can use Evenflo Xpand stroller for one child, but it’s also ready for two kids (infant and toddler). How great is that?! If you want to use it for newborn twins or two toddlers you will need to add second infant car seat or standard seat (sold separately). 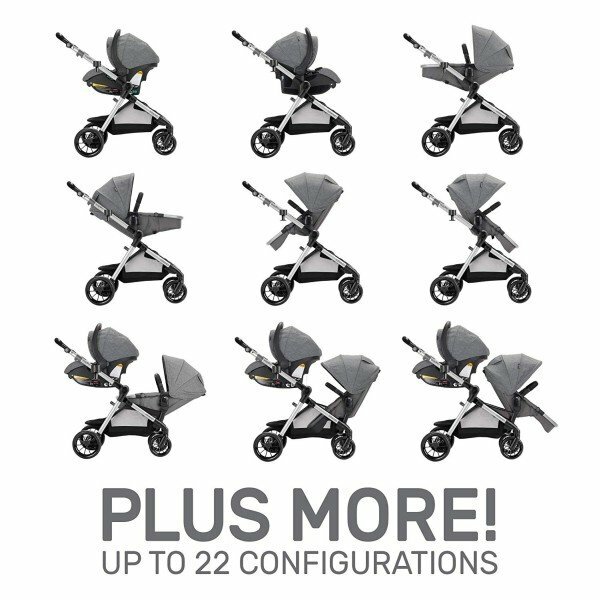 Even in the most extended version (with two car seats and two regular seats) Evenflo Pivot Xpand is about two times cheaper than UPPAbaby VISTA, Baby Jogger City Select LUX or NUNA Demi Grow in a double version! Thanks to modular design, Evenflo Pivot Xpand stroller can accommodate one or two infant car seats, toddler seats or two different seats – both rear and front facing. And the best part is that you can attach the second seat without any additional tools or adapters – everything is built-in. The toddler seat that Evenflo Pivot Xpand Modular comes with can hold a child up to 55 lbs. It offers 3-position recline in both parent-facing and front-facing mode. Reclining the seat is very easy and one-handed, just like in high-end strollers. Keep in mind that the seat doesn’t go to fully flat position. One-hand recline – love it! Reversing the seat takes only few second, everything clicks into the right spot. Easy-peasy. There is also adjustable footrest with 5 positions and removable bumper bar (no need to spend extra money on this item!). There is one more great thing about the toddler seat – it converts to infant mode. You just need to recline it, lift up the footrest and undo the clip on the back of the footrest. It’s not a carrycot (like on the regular Evenflo Pivot Modular), but it still provides comfy and safe space for little infant. The backrest is not completely flat so I wouldn’t recommend it for newborns, but you can start using it at about 3 months. 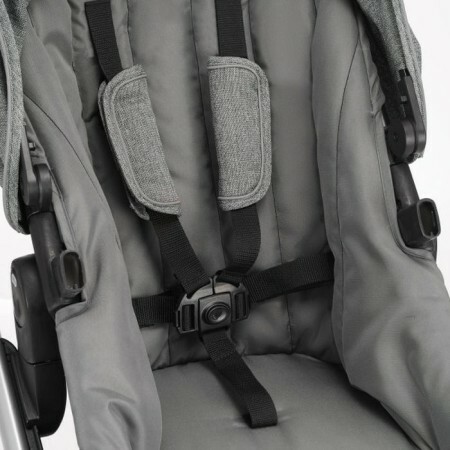 The interior of the regular seat has good amount of padding so the baby will feel comfortable and cozy in it. There is 5-point harness with covers on shoulder straps. I wish there was a cover for the crotch strap as well, so it doesn’t rub baby’s thighs. It’s not a big deal, but I had to mention it. Now let’s take a look at the 3-panel canopy. It’s not giant, but it shields the baby from the wind and rain, and keeps the sun out of baby’s eyes. There is also mesh peek-a-boo window which gives nice air-flow for the baby and allow you to check on him whenever you want (no noisy Velcro, yay!). Oh, there’s one more thing I need to tell you! When you use Evenflo Pivot Xpand for one child you can keep the regular seat in the middle position or you can slide the adapters to upper position – if you want to keep your little one closer to you. You’ll love that you don’t have to take the adapters off, they are built-in, you just slide them up and down. Awesome feature! The sibling seat has exactly the same features and weight capacity as the regular seat that this stroller comes with. So it beats VISTA’s Rumble Seat which offers smaller capacity for the sibling than the regular toddler seat. Toddler seat and sibling seat are exactly the same – and have the same capacity of 55 lbs! 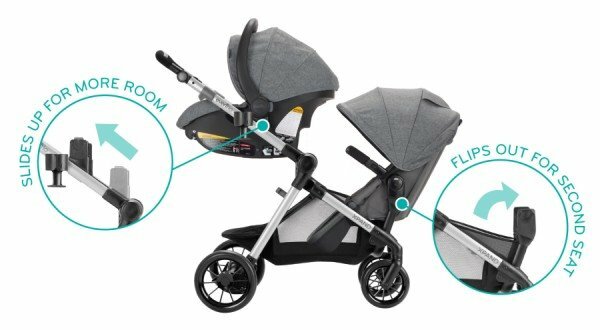 Similar to the single Evenflo Pivot Modular stroller, with one also comes with SafeMax Infant Car Seat which has really impressive results from safety tests. The car seat base is equipped with anti-rebound bar which is designed to limit rebound movement in case of a frontal impact. There are few features that help you to install the car seat base in your vehicle properly: multi-position base, recline indicator and integrated belt lock-off system. Besides, Evenflo allow you to schedule a video appointment with certified car seat safety technician guide who will help you with the car seat base installation! Adjuster for the harness is up front which makes it easier to tighten or loosen the straps. This car seat is also equipped with removable head pillow that adds comfort and security for smaller and lighter newborns. 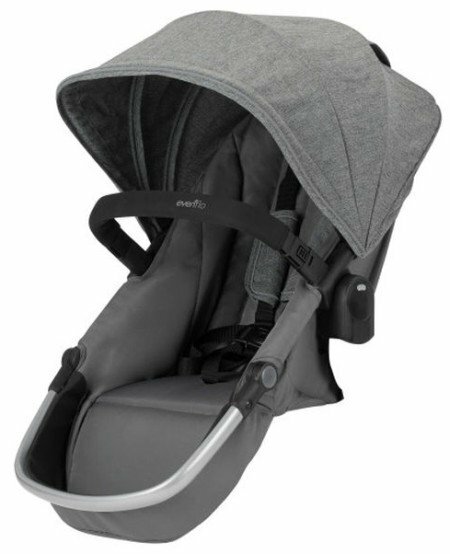 There is also good-sized canopy that protects baby from wind and sun, as well as ergonomic handle so you could carry the infant car seat to and from the car conveniently. And since it weighs only 7.6 lbs carrying it is literally effortless! Frankly, this is one of the lightest infant car seat on the market (if not the lightest). 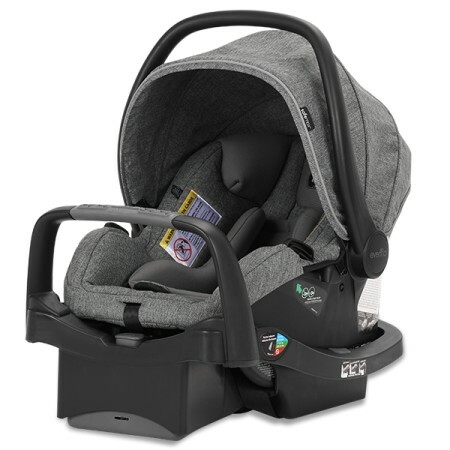 This car seat is suitable for a baby from 4 to 35 lbs and from 17 to 32 inches. 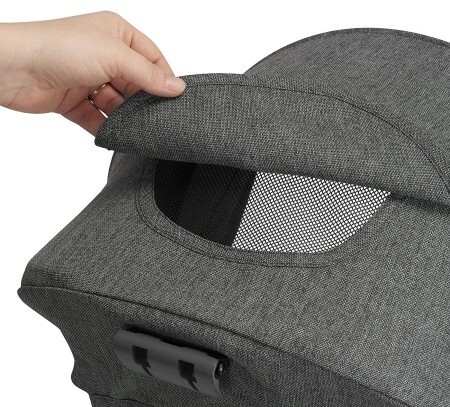 This is ultra-lightweight car seat – it weighs only 7.6 lbs! SafeMax Infant Car Seat easily clicks onto the stroller. It attaches to the same built-in adapters as the regular seat. You can attach it in the middle position or slide the adapters up and keep your newborn close to you. Not many strollers have that function. It’s really awesome because it’s easier to keep an eye on the baby and you can bond with him/her even more. 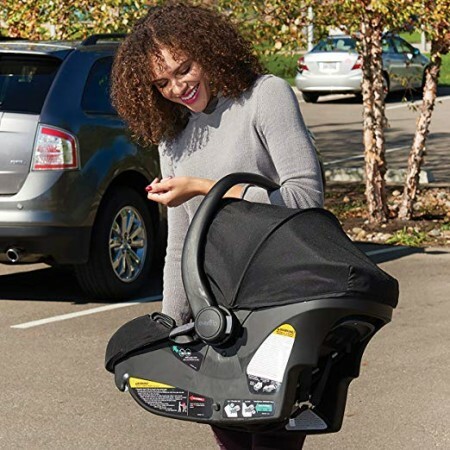 Evenflo Pivot Xpand Modular includes one infant car seat, but you can always purchase the second one separately (learn more about its features and current price). There are 22 seating combinations – some of them you can see in the picture below. What I like about this stroller in a double mode? First of all, it’s great that the sibling seat is exactly the same as the regular seat. It has the same features, the same capacity, the same size. Another awesome feature is that the adapters for upper and lower position are built-in. The upper adapters simply slide up and down so you can use them in the middle or upper position. 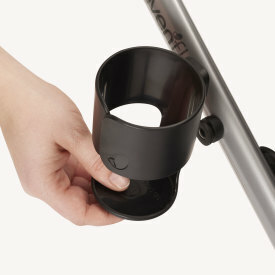 The lower adapters are hidden in the storage basket when not in use. You just need to flip them out and click the seat onto them. Easy peasy! You don’t have to remember about taking adapters when you leave the house or be careful not to loose them – everything is built-in! But that’s not all. Another thing that I love is the possibility to attach the infant car seat in upper position and toddler seat in lower position. Thanks to that your newborn is close to you and the older child can explore surroundings. Many parents complain about UPPAbaby VISTA configuration for infant and toddler, because the regular seat cannot be attached in the lower position, only the Rumble Seat, but it’s smaller and in many cases suitable up to about 2 years. Here you don’t have that problem – toddler seat easily attaches at the bottom, both rear and front facing. Just keep in mind that full recline is possible only in parent-facing mode in this version. You are probably wondering why this awesome and well-equipped stroller is so much cheaper than VISTA or City Select. Well, one reason is that Evenflo Pivot Xpand Modular is good only for city use. It has smaller TPE* wheels that are less versatile than rubberized tires on VISTA and City Select (which can handle grass or gravel). *TPE is a rubberized plastic which combines softness and flexibility with toughness and durability. What is noteworthy, wheels on Evenflo Pivot Xpand Modular are designed better than wheels on the old, single Evenflo Pivot Modular stroller. They are less smooth so the traction is better (they do not have thread but the structure is a bit rugged). 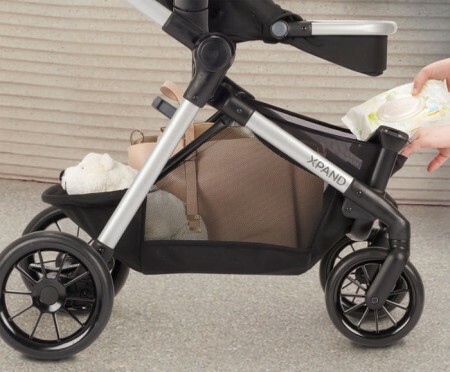 The rear wheels are bigger and have suspension to make the ride more comfortable, while the smaller front wheels swivel to make the stroller more agile and easier to maneuver. I’d recommend Evenflo Pivot Xpand Modular for walks on sidewalks, hard-packed gravel paths in parks, but that’s it. This is not an all-terrain stroller and it will stuck on uneven terrain and bounce. Frankly, the wheels are not bad, but you need to be aware that they are not as versatile as VISTA’s or City Select’s , before you decide to buy this stroller. That’s it. 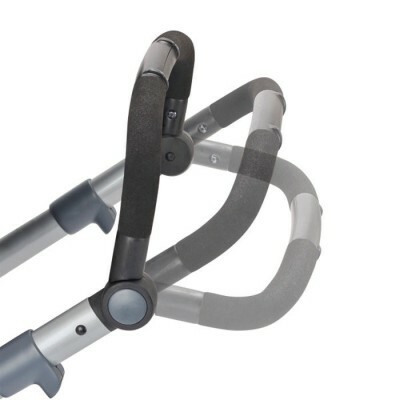 Evenflo Xpand stroller has 3-position handlebar that adjusts by rotation. Thanks to that pushing the stroller will be comfortable for most parents. 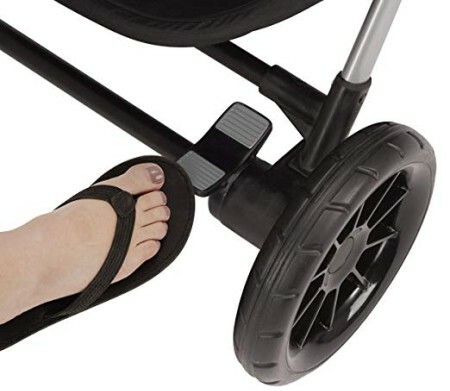 Evenflo Pivot Xpand Modular has foot-operated parking brake which is quite easy to use even in sandals and flip flops. The pedal is located near the right rear wheel, it’s fairly big so you won’t have problem with finding it with your foot. This is another feature that I love about this stroller. It has enormous basket underneath the seat. It is 2ft long! Can you believe that?! There will be enough space for your diaper bag, blanket, jackets or few shopping bags. With two kids onboard you need a lot of storage space for all baby gear. Big plus for Evenflo for such a spacious basket! Evenflo Pivot Xpand Modular is not the smallest and lightest stroller on the market, but its weight and size is typical for expandable strollers. It weighs about 28.6 lbs with one toddler seat and about 36 lbs when you add infant car seat as well. The frame itself weighs 22.4 lbs – it has to be strong and big enough to hold two kids. It is 26.5” wide so it fits through standard doorways. With one toddler seat it’s 34” long, if you add the second seat it gets longer and more bulkier, but it’s still more compact than regular tandem stroller or side-by-side buggy. But you should keep in mind that double version may be more difficult to maneuver in narrow or crowded spaces. You will have to make wider turns. And it may not be ideal for tight alleys in grocery store or restaurant, but it’s the same with any other single-to-double stroller. I’m sure you are curious how this stroller looks when folded and if it fits in car trunks. 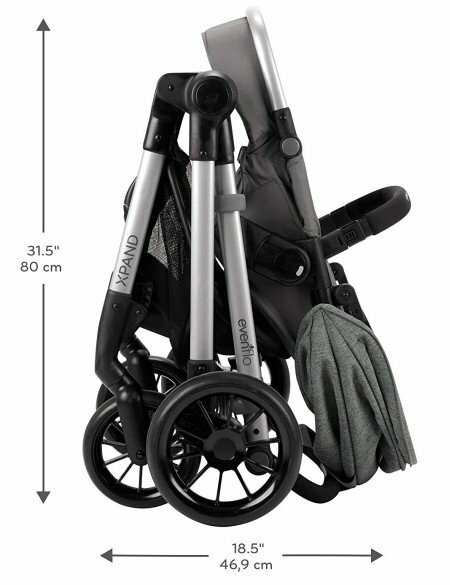 Dimensions of folded Evenflo Xpand stroller with one seat are: 26.5” x 18.5” x 31.5” (WxLxH). It’s almost exactly like UPPAbaby VISTA’s fold size! Folding mechanism itself is very simple – you just need to lift two toggles on both sides of the handlebar, the seat will fall backwards and the stroller will fold in half. It literally takes few seconds. 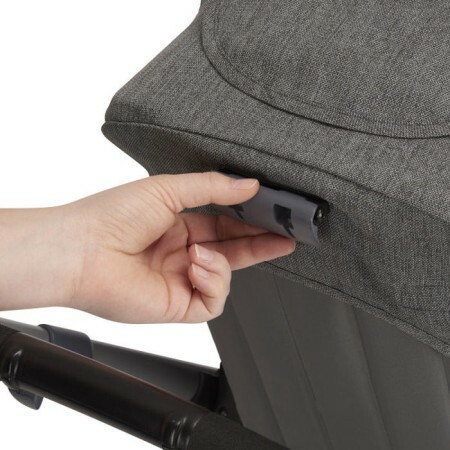 You can fold this expandable stroller with or without the seat and to make it more compact you can lower the footrest and detach the bumper bar. It should fit in majority of car trunks. 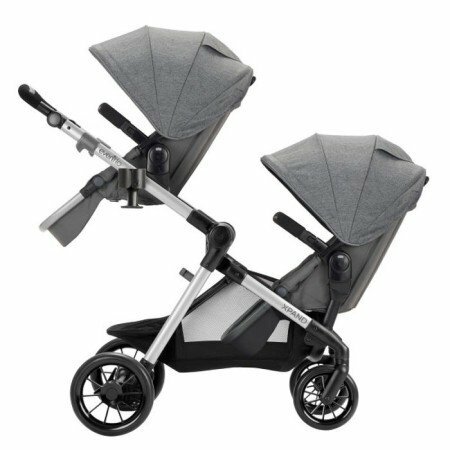 This stroller comes in three color versions: Roan, Percheron and Stallion (which looks like a grey melange – it’s beautiful!). If you’d like to check which colors are available right now and see their prices on Amazon – click here. 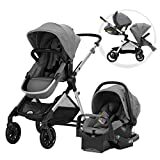 Evenflo Pivot Xpand Modular Travel System comes with one infant car seat (+ base) and one toddler seat so it’s ready for use as a single stroller or as a double stroller for infant and toddler. It is equipped with large storage basket and one parent cup holder that expands for larger bottles. There are few more items that you can purchase separately- seats for sibling or a standing board for the third child! Sibling seat – great thing is that it’s exactly the same as the regular toddler seat (the same features and weight limit). You can use Evenflo Xpand with two toddler seats. No need for additional adapters. SafeMax Infant Car Seat – Ultra-light infant car seat with awesome safety features. 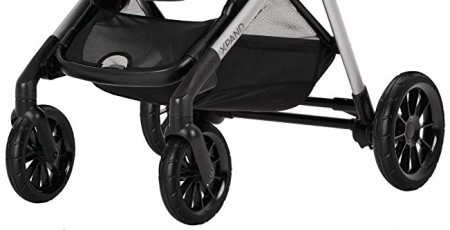 You can attach one or two infant car seats onto the Evenflo Xpand frame. Adapters are included with the stroller. Adapter for other infant car seat brands – This additional adapter allow you to attach Chicco KeyFit 30, Graco SnugRide 30, 35 and 40 and Peg Perego Primo Viaggio car seats. Available from October 2018. Rider Board – perfect place for older sibling. Evenflo Xpand can serve you as a stroller for three kids! Available from October 2018. As a double stroller it is quite long so it may be more difficult to turn and steer in tight places. This stroller is mainly for city use and flat terrain. It won’t work well on bumps and it’s not suitable for off-road walks. 1. It is really well-equipped and inexpensive. The basic set includes infant car seat & toddler seat, built-in adapters, parent cup holder and useful features like adjustable handlebar and XXL storage basket. 2. This is a good-quality, cheap alternative for high-end expandable strollers. 3. It has nice, sleek design. Do you like Evenflo Pivot Xpand Modular? Before you decide to buy it, make sure to read customer reviews on Amazon and check if there are any discount available. You can do it by clicking here. If this expandable stroller doesn’t meet your needs, you should check out other top strollers for growing family. If you’d prefer a single stroller that accepts many add-ons, check my list of the best convertible strollers in 2019 or my ranking of the best travel systems. I want to buy this for my 2 toddler boys, that are 1 and 2. My 2 year old is already 39 inches tall. Do you think that he will be able to get much use our of the seat, height wise? What is the length of this stroller with the car seat and toddler seat attached? Trying to figure out if it will fit unfolded in the entryway of my apartment. Thank you! it’s 43 inches long (+/- 1 inch). Do you happen to know how tall the backrest of the seat is? I think it’s about 17-18 inches tall plus there are about 5 inches above it, to the top of the canopy. Do you know if the car seat adapter has been released yet? My daughter is expecting twins and has her sights set on this stroller. She already has a pair of infant car seats but she will need the adapters. Hi Diana! The adapters will be available probably in January 🙁 They will accept these infant car seats: Graco SnugRide 30/35/40, Graco SnugLock 30/35, Chicco Key Fit and Peg Perego Primo Viaggio. Would love to see a comparison of this vs the Graco Uno2Duo which seems to be very similar. Having a hard time deciding between the two but this is an amazing, thorough review of the Evenflo; thank you so much! 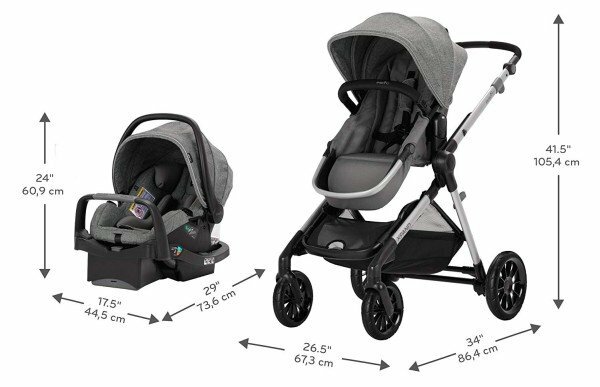 Do you know if this stroller system is compatible with the Nuna PIPA Lite car seat? Or adapters for purchase? According to the manufacturer information this stroller is only compatible with Graco SnugRide 30, 35 and 40, Graco SnugLock 30 and 35, Chicco KeyFit and Peg Perego Primo Viaggio. And of course Evenflo car seats. Did you find this info on Evenflo’s website? I’ve been trying to find out what car seats would be compatible with the stroller! I really like (almost) everything about this stroller and would love to buy it. But I do NOT need or want the infant car seat. Do you know if they sell it just as a stroller with the frame and seat alone? Just saw this stroller in person at Target, it’s finally released! I have to say I am extremely disappointed 🙁 It is not nearly as easy to change configurations as described and the car seat is extremely difficult to get the right click in. As a matter of fact, when arriving at the store it was already stuck maybe by the last frustrated person and so I had to get a store employee to pry it off. Once we got passed that, it didn’t steer well and the quality just seemed overall lacking. So sad since I had my heart set on this, but as much as I wanted to love it, I couldn’t look past the major flaws in person. Hi Michele, thanks for sharing your experience, I really appreciate it! I’m wondering if the adapters could have been broken or something (maybe by that frustrated person you’ve mention :)) because everything should click in and out quite easily.